The odometer hit 2362 miles and I had the day off so I decided to change the oil in Chief #31. The dealer Indian of Wichita performed the 500 mile service and then the 2500 mile service @ 1316 miles (a little early), but they wanted my new ownership experience to be pleasant and I thank them for that. 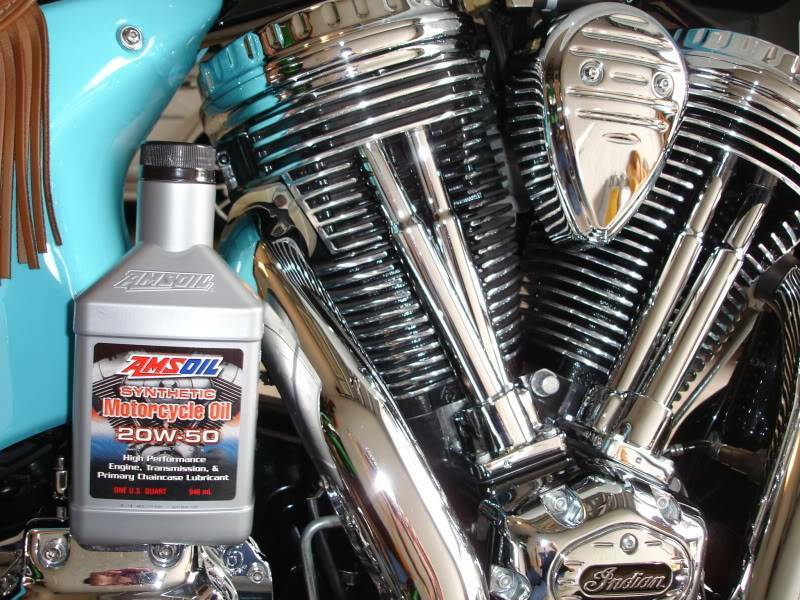 I called the local AmsOil distributor and purchased 7 quarts of the 20W-50 Sythetic Motorcycle oil. I have a couple Indian chrome oil filters from EBay on the shelf so I was ready to go. First I got my drain pan and slid it under the drain plug. I removed the fill/dipstick plug and wiped it clean and set it aside. Next I used a 3/16" allen wrench to remove the plug. The used oil streamed out looking pretty good (reddish tint), of course it only had ~ 1235 miles of use. The magnetic pick-up on the plug was very clean, no metal shavings. The "O" Ring looked in great shape so I just wiped off the threads and the ring with a clean rag and set it aside. The oil finished draining so I slid the pan up under the crankcase and removed the other drain plug using the same 3/16" allen wrench. The crankcase plug is identical to the oil pan plug and its magnetic pickup was also perfectly clean (no metal shavings). I was suprised how much oil drained out of the crankcase. I would estimated 6 to 7 ounces of oil was removed. 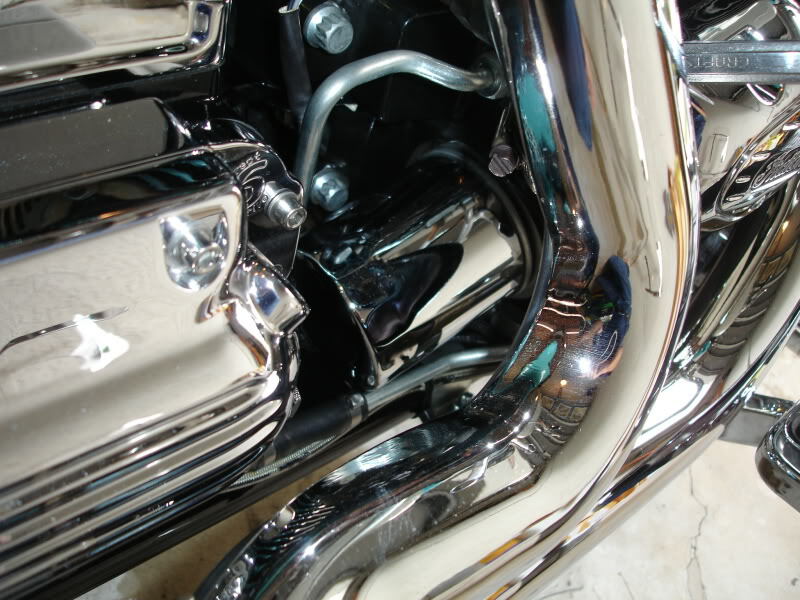 I also, wiped the threads & ring clean and re-installed the plug when the oil stopped dripping. Now it was time to remove the old filter. Now there is an oil line that runs directly behind the filter. This line must be removed to allow the filter to be spun off and removed. You will need a 5/8" wrench & a 9/16" wrench. See photo for fitting & wrench placement. The fitting easily was un-coupled and since the tubing has a short length of rubber hose its easily pulled back out of the way. I next used a pair of 4" Channel locks to carefully grip the bottom of the old filter cartridge, turning it counterclock wise until it loosened enought to be removed by hand. Next I opened a fresh bottle of AmsOil and prefilled the new filter about 1/2 way (~4 ounces of oil), any more and it will spill out when you install it. Also make sure to rub some clean oil on the filter gasket. 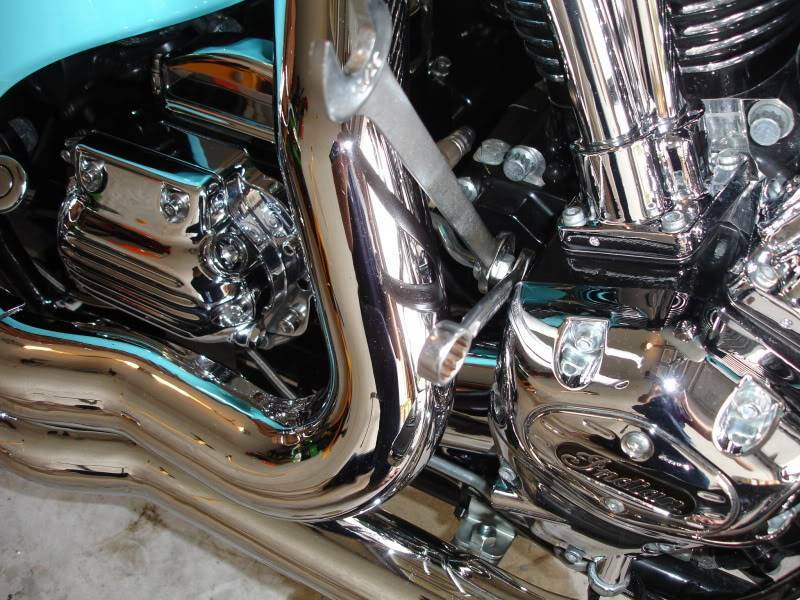 The filter can then be lowered in behind and above the rear exhaust pipe. The rotate the filter forward and start threading it on the filter boss. I like to tighten my filters snuggly using hand strength only, I've never had one leak and it allows you to remove it next time by hand as well. See photo of new filter in place. I then reconnected the oil line that I had removed earlier for filter access. Next I re-installed the drain plug in the oil pan and poured another 2 full quarts of of 20W-50 on the pan. Now Indian states the oil change requires 3 1/2 quarts with a filter change. So I need to add about another 1 1/4 quarts in addition to what I've already added. I poured in another 3/4 of a quart and I noticed the Oil level was almost full. This I reasoned is because not only is the filter half empty but the crankcase I drained earlier is also empty. At this time I inserted the fill/dipstick plug. I looked over all my work and checked both drain plugs installed & tightened. Filter installed and tight, oil line reconnected - all checked. Now its time to start the engine and complete the fill of the filter and re-eastablish level in the crakcase. The engine fired to life and soon I heard the valve lifters produce a bit of clatter as they refilled with oil. After about 30-45 seconds I shut the engine off, removed the fill plug and added the rest of the remaining oil to the oil pan. I cleaned off the dipstick and the level was right between the high & low marks closer to the full level. I recorded my mileage 2362 and my operating hours 69.5 to be addeded to my maintenance record in the owners manual. Now, its time to go for a test ride with a happy engine in Chief 31. Took a 15 mile ride throught the quiet country town of Parkland Florida admiring the stables and huge mansions of the rich who hide out in this quiet town, all in all a very peaceful ride for S. Florida. Came home checked the oil level - good - no leaks even better. Hope this helps any do it your-selfers. I have a 2009 Chief. Does anyone know the proper specs for aftermarket oil filters? Are they the same as the filters for the 02-04 bikes? I was looking at using an Amsoil 135C, but it's about an inch longer, and may not fit with the oil line that runs behind the filter. Thanks.